2016 was a great year for animation. We’ve travelled to Polynesia with Moana, traversed a risque supermarket in Sausage Party, and entered a world run by lovable animals in Zootopia. After a bombastic year, you’d expect things to tone down in 2017, but fear not, there’s already a swathe of excellent animations on the horizon, and it’s only January! 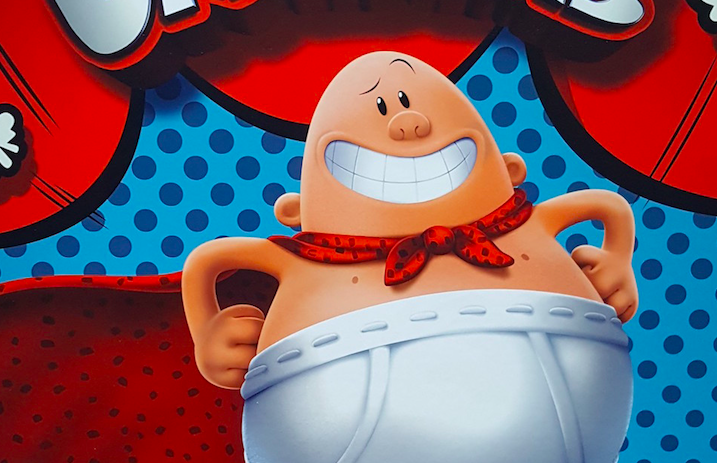 Any millennial worth his salt will know of Captain Underpants. Published around the turn of the century, these purposefully rude children’s books were loved by kids of all ages for their humour and unique comic book style. The premise is just as ridiculous as the title itself – two fourth grade students bring their comic book creation to life by hypnotising their evil principal, Mr Krupp. Thankfully, Dreamworks have finally picked up the series for a theatrical release in 2017. The film will be directed by Rob Letterman of Shark Tale and Monsters Vs Aliens as well as David Soren, an animator with credits on The Road to El Dorado and Shrek. A selection of great actors already tied to the project includes Kevin Hart, Ed Helms and Thomas Middleditch. Expect a trailer very soon, as there hasn’t been much said about this promising title beyond the image above! A bit of a weird one here, but we’re not complaining. Based on a children’s book by Marla Frazee, Alec Baldwin is set to play an infant who has a lot more to say than the typical gurgles. The story is founded on sibling rivalry, as Tim narrates the tale of his baby brother, a ‘Boss Baby’ who prefers to wear a suit and tie than play around in a babygro. Apparently, babies are no longer getting enough love in comparison to puppies, and our lead character is on a mission to swing the pendulum back in the right direction. The movie is being handled by Dreamworks and composed by the legendary Hans Zimmer, and promises to be a heartwarming tale beyond the jovial surface. Ever since Apple integrated the revolutionary keyboard, it feels like the world has been completely enamoured by Emojis. Whether it’s the Eggplant or Tears of Joy, everyone has a favourite and it’d be hard to find a mobile conversation in 2017 without one. Sony Pictures Animation are injecting some character into these word-replacing animations with a story about Gene, an emoji who can express himself in a multitude of ways. A number of famous actors have been tapped to play some of our favourite emojis, including James Corden and T.J Miller. Not much is known right now, but expect a full trailer in the coming months to tell us more about the wacky story told in the teaser above. After the instant success of The Lego Movie, it looks like Warner Animation Group are taking a chance on another animated LEGO movie, this time focusing on the incredibly popular DC Comics franchise, Batman. The trailers suggest this is going to contain all of the same tongue-in-cheek humour, supported by an all-star cast. Will Arnett will reprise his role as Bruce Wayne, with Zach Galifianakis taking the role of The Joker. It’ll be interesting to see how his unique brand of comedy melds with the legendary villain. The visual aspect of The Lego Movie was fascinating and a fresh new angle on contemporary animation, so it’ll be interesting to see how this will be expanded when it releases in February. Another Disney classic reimagined for the big screen much like The Jungle Book before it, Beauty and the Beast attempts to recapture the magic with a star-studded live-action cast and gorgeous animation quality. Belle will be played by Emma Watson, in perhaps her most star-studded role since Hermione Granger. From the trailer, we can see that they’ve kept most of the musical aspects and have done an amazing job of bringing some of the minor characters to life, like Lumiere and Mrs Potts, who have been given an incredibly realistic look. They’re also voiced by Emma Thompson and Ewan McGregor no less. Of course, these are just a few of the fantastic animations hitting cinema screens in 2017. Feel free to tell us what you think and send us your suggestions on Twitter!